Red Velvet Cements Its Aesthetic In "Dumb Dumb"
After a month of limited internet, I knew I had a lot of K-pop to catch up on — but I did not expect a Red Velvet comeback to be one of them. Teasers were already being released, and the contrast between the Pippi Longstocking-esque factory mannequins and the block print casual clothes princesses was giving me whiplash. Fortunately, though, I didn’t have to wait too long for an explanation of these style choices. “Dumb Dumb” is a very visually striking MV. 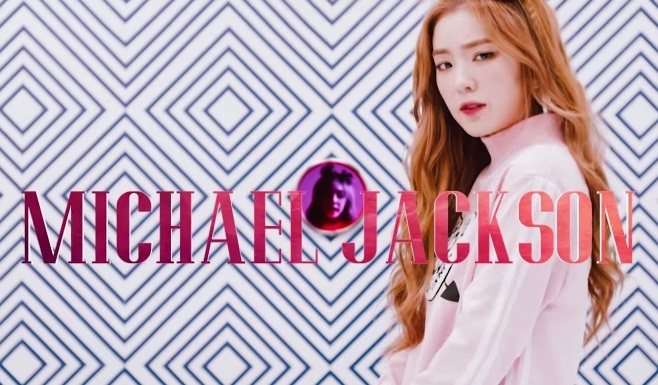 The effects and transitions are bold and pack a punch, matching nicely with the song’s fast tempo, clap beat and horns… All of which may remind you of Jessie J‘s “Bang Bang.” There is very little about this MV that is delicate, perfectly matching the bold, or “red” aspect of Red Velvet’s group concept. Solid colours and digital effects are fast becoming hallmarks of Red Velvet’s “red” MVs, giving them an added surrealist feel. 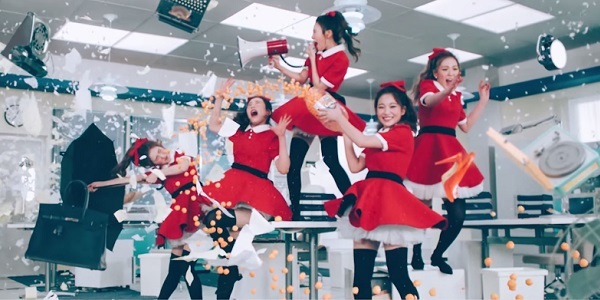 “Happiness” broke the usual SM MV model with its digital collages and hyper-composited scenery, while “Ice Cream Cake” added in bouncing balls and giant cats. In “Dumb Dumb,” the compositing of the members is interwoven into the MV’s factory setting, as mannequin after robot mannequin is churned out. It’s also used to up the surrealism in the scenes with Yeri and Wendy, and then carried over to the close-ups and dance cuts, thus maintaining thematic relevance. The colour blocking fashion seen in the most exciting of the dance scenes (as shown in the featured image, at top), matches well with the bold tune of the song. The one-legged stocking look combined with the shorts-and-stockings style may be overkill (not to mention the white sandals), but it does contribute somewhat to the blocking effect of the Ralph Lauren polo shirts. Yes, the members are still indistinguishable at points (I confused Irene and Seulgi for a good while, myself); but at this point it has to be accepted as part of SM’s design for Red Velvet. “Happiness,” for example, went to great lengths to make the members look as similar as possible: the monolidded Seulgi’s eye make up was applied differently to match the other members’ double eyelids; and even heights were matched as much as possible by putting Joy in flats and Irene in the tallest wedges you have ever seen. Then, of course, was the Aryan chic of Ice Cream Cake. And now, we have the Pippi Longstockings look. Like it or not, the clone look seems here to stay. Red Velvet has been geared towards a permanent double-sided image, so the more casual and personalised outfits and the red dress uniform of the mannequins could be simply explained as representing the “Red” and the “Velvet.” However, the MV allows us to find some more details on this difference, thanks to the appearance of a black car. We see chess pieces floating up and away, disembodied legs stretching out of boxes, a dozen or so Yeris and Wendys (Wendies?) running about, a porcelain baby doll and egg smashing to smithereens, and that end scene with the girls ransacking the place. But it’s all a bit random, especially considering the thought put into connecting the visual aspects of the MV. Not helping matters is the amount of time dedicated to rapping, and the lack of proper transition from said rap to the song’s climax. With the influx of increasingly competent rappers into the K-pop scene, the idols assigned the “rapper” label by their agencies are having a harder time of it. Irene is the ultimate Bae, but her rapping leaves the listener wanting. What’s more, Joy is made to rap as well, despite possessing a sweet voice that is a point of difference to Seulgi and Wendy’s huskier tones. Her rapping is no longer as nasal as it was in “Happiness,” but would it kill SM to have less rapping and more singing, both in general and especially where Joy is concerned? 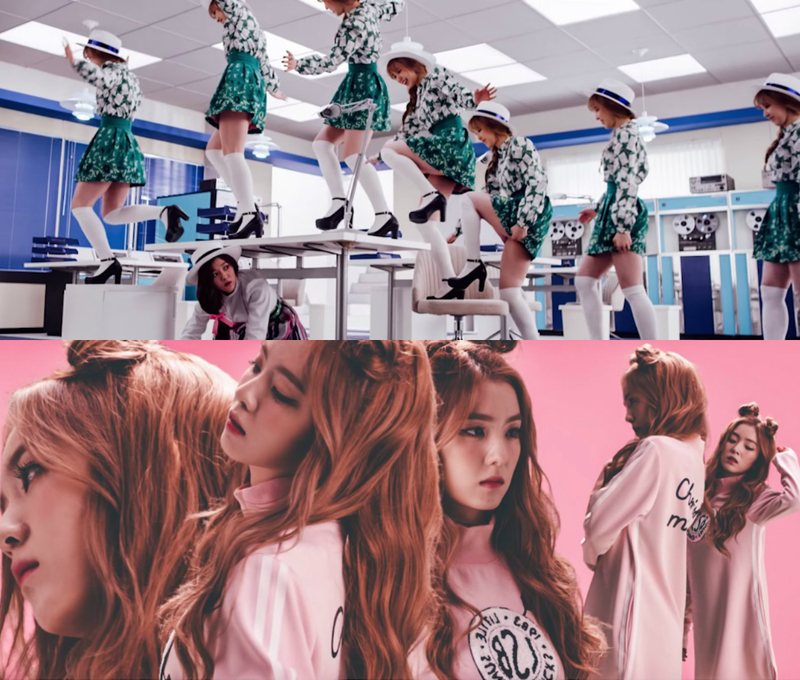 Ultimately, Red Velvet still needs to work on its musical style and direction. The group has a great vocal colour — Seulgi and Wendy, especially, handle singing at a high pitch well, and largely avoid sounding shrill — so it’s just a matter of finding the right style to complement their voices. And maybe some more training for Irene. Aesthetically, though, Red Velvet now has its own distinct MV style — something that I did not think was possible for a Big 3 group, let alone a SM one. Even something I would normally miss, like extended shots of the dance, are refreshing in their absence. The company and its creative directors have hit the jackpot in this regard, and I hope that they stick to this style for Red Velvet. It just won’t do to mess with something good.